Trying to put a ‘Y’ in tennis? The Australian Open recently concluded after two weeks of professional smacking of the furry green ball. Much of the tennis on display in Melbourne will not be found on the court I occupied this afternoon. But there was one moment that I did see which was up there with the best of them (arguably). My teammate launched himself into a big overhead smash only to find that the ball disappeared on impact. A sheepish yet hilarious moment unfolded when the opposition informed him that the ball was nicely wedged in the ‘Y’ frame of his racquet! (For the punters out there, we went on to win 6-2) I got my pal to recreate the moment afterwards for posterity. I’ve used Colour Splash for this pic. The ball is full colour while I have added just some of the colour back to the surrounds. 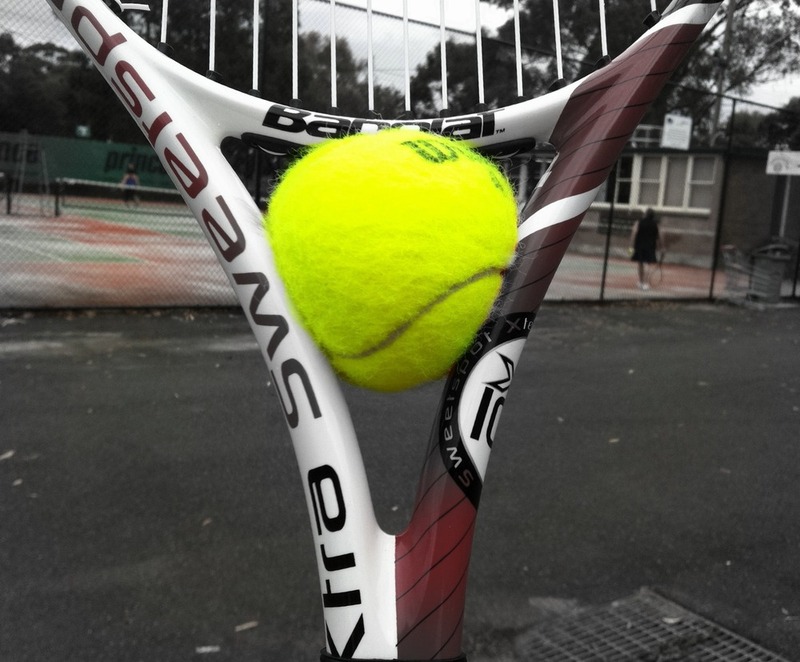 I have definitely had one of those moments of ‘where did that ball go?’ Unfortunately I didn’t get to play tennis today due to the weather but after watching the Australian Open over the last couple of weeks I was beginning to think my tennis skills mirrored the ones I saw on TV. I was very quickly brought back down to earth when I actually took to the court! Thanks Mel! I know what you mean. It was great to be back on the court again after a break. But yep…my backhand provided me with a nice dose of realism today. Sort of reminds me of the time I was at the beach. I’d spent minutes swishing a pesky fly away, and suddenly it totally vanished. Satisfied, yet slightly perplexed at the disappearance of the pest, an unusual statement then came my way…"I don’t think I’ll ever say this sentence again…. but you have a fly on your tooth." I did say ‘sort of’ reminds me!